Becky Galli was born into a family that valued the power of having a plan. With a pastor father and a stay-at-home mother, her 1960s southern upbringing was bucolic—even enviable. But when her brother, only seventeen, died in a waterskiing accident, the slow unraveling of her perfect family began. Though grief overwhelmed the family, twenty-year-old Galli forged onward with her life plans—marriage, career, and raising a family of her own—one she hoped would be as idyllic as the family she once knew. But life had less than ideal plans in store. There was her son’s degenerative, undiagnosed disease and subsequent death; followed by her daughter’s autism diagnosis; her separation; and then, nine days after the divorce was final, the onset of the transverse myelitis that would leave Galli paralyzed from the waist down. Despite such unspeakable tragedy, Galli maintained her belief in family, in faith, in loving unconditionally, and in learning to not only accept, but also embrace a life that had veered down a path far different from the one she had envisioned. 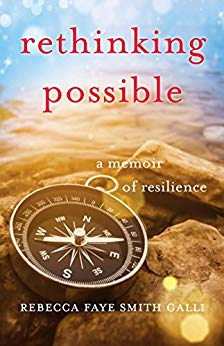 At once heartbreaking and inspiring, Rethinking Possible is a story about the power of love over loss and the choices we all make that shape our lives —especially when forced to confront the unimaginable.